The three winter exhibitions at ARTER are all very different but somehow work harmoniously over the gallery’s three floors. ARTER has a knack for turning each of its floors into a completely unique space and it succeeds in this respect once again. Each of the exhibiting artists this season has a Turkish connection – they were either born in Turkey or are Turkish by nationality. After the outstanding Mat Collishaw exhibition this summer and a melange of international artists during the biennial months, it was time to go back to home-grown talent. The bottom level is reserved for the Istanbul-born-and-based artist Aslı Çavuşoğlu’s latest archaeologically themed show, The Stones Talk (above). Curated by Özge Ersoy, the exhibition ‘explores the potential of forming narratives with archaeological and historical information, and telling pluralistic stories through objects,’ according to Ersoy. Much of Çavuşoğlu’s oeuvre is concerned with how history can be read in order to question who, or what processes, enabled its writing and why. This exhibition follows suit. For it, Çavuşoğlu produced 71 copies of archaeological artefacts using the original material of the artefact (eg ceramic, bronze, glass, volcanic rock) and an added part made from a modern material (eg acrylic, foam, rubber, copper). 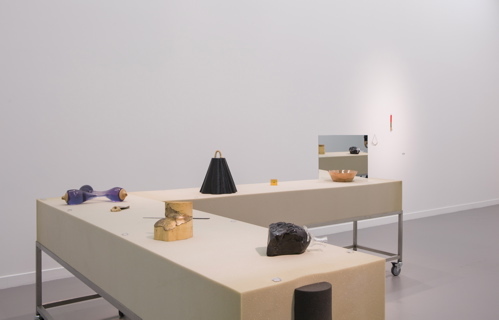 The artist also designed special pedestals from high-density foam, rubber and wood on which to place the objects, randomly numbering them from 1 to 71. The archaeological artefacts on which Çavuşoğlu based her copies were discovered at various excavation sites in Turkey. These, and many like them, belong to a pool of artefacts deemed unworthy of exhibition. Instead, they are classified as ‘study pieces’ as they do not provide sufficient information about where they come from (which object they were attached to, for instance). Kept either in museum stores or university departments for future research, these artefacts are, in a way, forgotten. By adding a new dimension, Çavuşoğlu gives them form and meaning, and thereby creates completely different objects. In affixing a present-day material Çavuşoğlu is also commenting on the reproduction of historical objects and sites for contemporary purposes. Some of my favourite pieces are those in which the artist plays with texture. 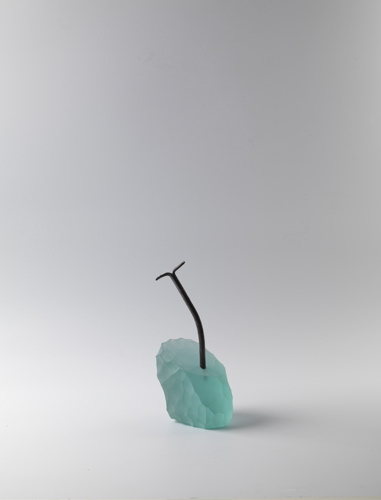 In ‘27’ (above), she combines coloured glass with an iron pin to create an attractive mini statue reminiscent of a tropical island. 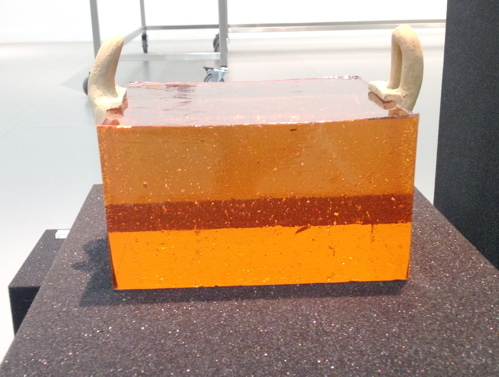 In ‘50’ and ‘56’ (above), broken pieces of ceramic, perhaps from a vase, are attached to the top of an epoxy rectangle – the feel is of devil’s horns atop orange jelly. 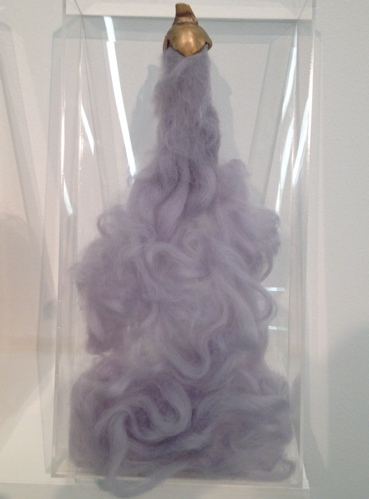 In ‘9’ (above), a purple ponytail made from felt is attached to a piece of bronze inside a plexiglass box, creating something akin to a hair extension found in a costume department. I also really liked the above works, ‘57’ and ‘58’, in which ceramic and copper semi-circles are positioned around a mirror – imperfect halves forming a whole and giving completely different perspectives depending on your viewpoint. 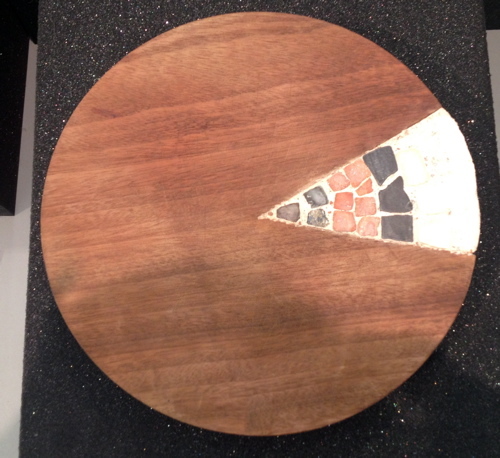 And, in ‘29’ (above), a wooden circle with a mosaic wedge is transformed into a stylish pizza board. This is a meaningful and exhaustive work from a talented young artist. Her best-known work, Murder in Three Acts, caused quite a splash at Frieze in 2012, and her current exhibition is further evidence of a fruitful career ahead. 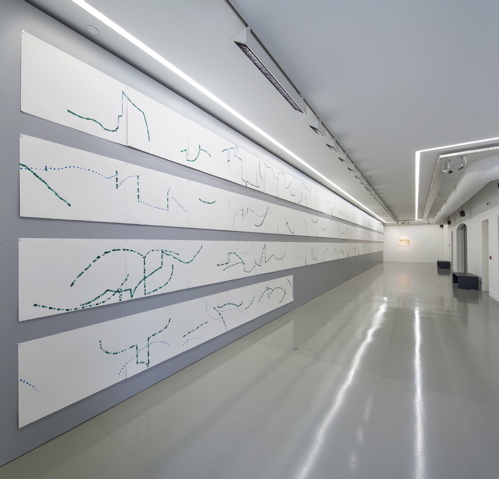 On the first floor, the lights are dimmed for Fatma Bucak’s first solo show in Turkey. 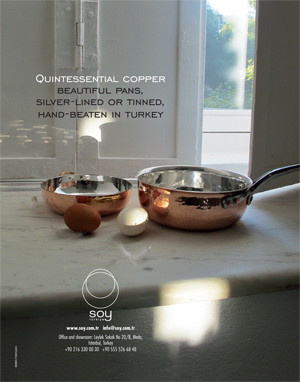 Bucak was educated at the Royal College of Art in London and works between London and Istanbul. The young artist’s work embraces performance, video and photography, and brings in observations from reality and constructed fictional, mythological aspects. One of the central themes in Bucak’s oeuvre is gender identity, and she weaves in elements of religion, cultural displacement and male power. Başak Doğa Temür, who seems to have a penchant for these kinds of issues, tackling similar ones when she curated the aforementioned Collishaw show, steps up to the plate to curate a powerful and dark exhibition – and delivers. Entitled Yet Another Story About the Fall, there are five works in the show. The title takes its name from the creation myth and goes back to the very beginning – the fall of man from heaven to earth. Bucak produced a two-channel video installation especially for the exhibition. Shot at Tuz Gölü (the salt lake in Central Anatolia), the first part, ‘And then God blessed them’ (above top), places female and male archetypes under harsh conditions. 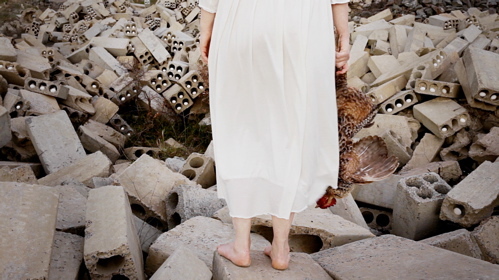 As in many of her other works, Bucak uses her own body in the video as an anonymous female figure and is accompanied by her brother. 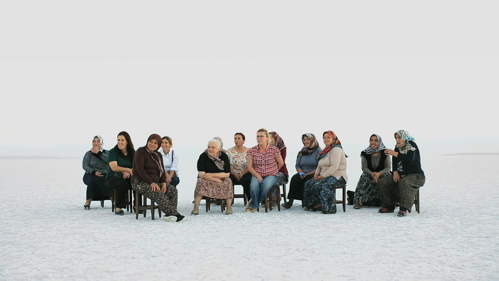 In the second part, ‘Suggested place for you to see’ (above bottom), a group of women invited by Bucak to take part as ‘viewers’ discuss her performance. The sometimes poignant, often hilarious comments of these 13 women (a significant number referencing ‘The Last Supper’) become a performance in itself. As Bucak endeavours to make viewers question male and female roles in society, her female ‘viewers’ bring in some interesting perspectives of their own – as well as raising questions about how audiences contemplate and interpret art. In the other four pieces, Bucak continues to reverse and re-enact myths, religious parables and autobiographical narratives. 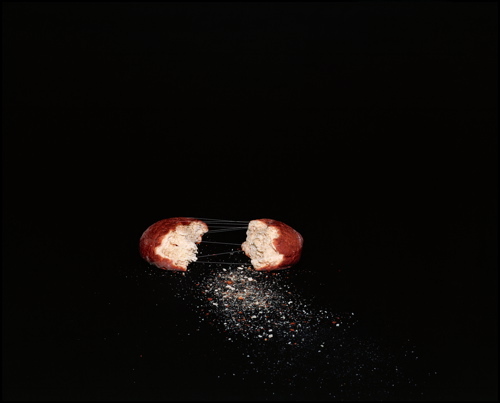 The broken loaf of bread, which the artist tries to saw back in the above work, recalls the efforts of different communities to live together in the same land. Meanwhile, the egg in the above video ‘gives an uncanny sense of what is about to happen’, according to Temür. Bucak is clearly fascinated by unusual landscapes. 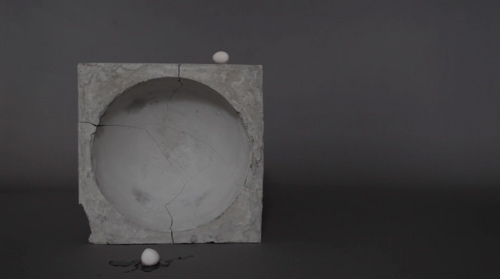 In her 13-screen installation, ‘Omne Vivum Ex Ovo – Nomologically possible, anyhow’ (above), Bucak explores women’s child-rearing responsibilities by filming a woman placing eggs in the holes of concrete blocks (the title is Latin for ‘all life is of the egg’). Is she doing this so they mature and hatch when the time is right? Can life really be created in this barren landscape? And if it can, what kind of life will it be? 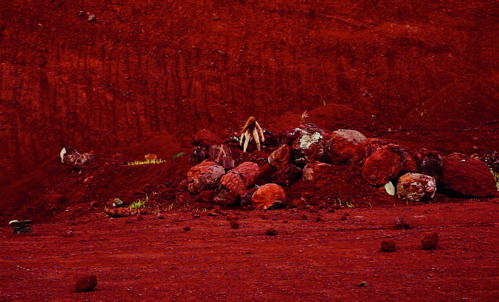 In the final video, ‘Four Ages of Woman – Fall’ (above), the naked female figure, isurrounded by scarlet-coloured land, throws rocks at an invisible enemy. For me, this was the most visually and metaphorically arresting video – in this apocalyptic, fertile land, the female is surviving and thriving; she overcomes her struggles and writes her own story. 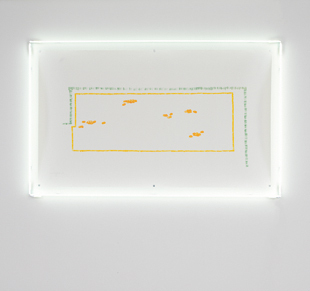 On the top (third) floor are three pieces by the conceptual artist Sarkis. I have been to a number of exhibitions by this renowned Turkish-born Armenian artist and I want to understand and appreciate his work, but in all honesty I sometimes struggle. In this latest offering, Sarkis creates three works inspired by the famous Ryoanji Zen garden in Kyoto, Japan – considered to be one of the finest examples of a kare-sansui, a Japanese rock garden, in the world and a UNESCO World Heritage Site. The garden was a source of inspiration for the great American composer John Cage, a pioneer of indeterminacy music (referring to the ability of a piece to be performed in substantially different ways). Cage scored his flute solo ‘Ryoanji’ in the early 1980s, some 20 years after his visit to the garden, in which he remarked that the 15 stones arrayed in the sand at the garden could have been laid virtually anywhere to produce the same effect of tranquillity and contemplation. 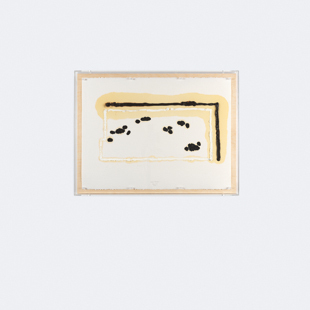 Now, over 30 years later, Sarkis, who describes Cage’s score as ‘the dance of lines on a blank paper and of calligraphy’, painted 96 watercolours with his fingertips, as a kind of a homage to the composer (above). This centrepiece is accompanied by a soothing score – a pre-recording of an interpretation of Sarkis’s watercolours by the great ney player Kudsi Ergüner and the shakuhacki player Jean-François Lagrost (the above video shows the recording of the piece at the gallery). Two smaller pieces (above), representing the plans of the garden, flank the main attraction at each end of the space. This conceptual exhibition, inventively curated by Melih Fereli, is undoubtedly unique but I found it more interesting post-visit. While I was actually experiencing it, the minimally painted watercolours didn’t resonate with me entirely and the accompanying brochure is unfortunately not detailed enough, but doing a bit of research and contemplating the pieces later, the theme of music drawing from visual art for inspiration and vice versa comes powerfully to the forefront. The more encompassing theme of inspiration in general – and the melding of geographies, cultures and eras in the process – reverberated with me long after my visit. All three exhibitions run until January 12. All images, except numbers 4, 5, 6 and 7, are courtesy of ARTER. Main image, image 2 and image 14 are taken by Mustafa Nurdoğdu. 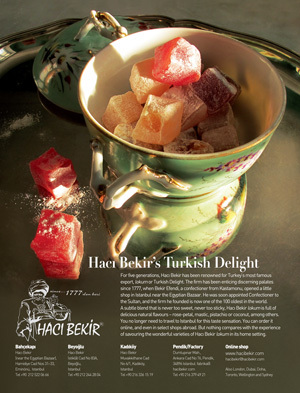 Image 3 taken by Hadiye Cangökçe. Images 4, 5, 6 and 7 taken by Victoria Khroundina.